Flowering crab trees are susceptible to a medley of diseases, some of which can cause severe injury. Though you may choose disease-resistant flowering crabs based on region, certain diseases can mutate leaving previously resistant trees susceptible. 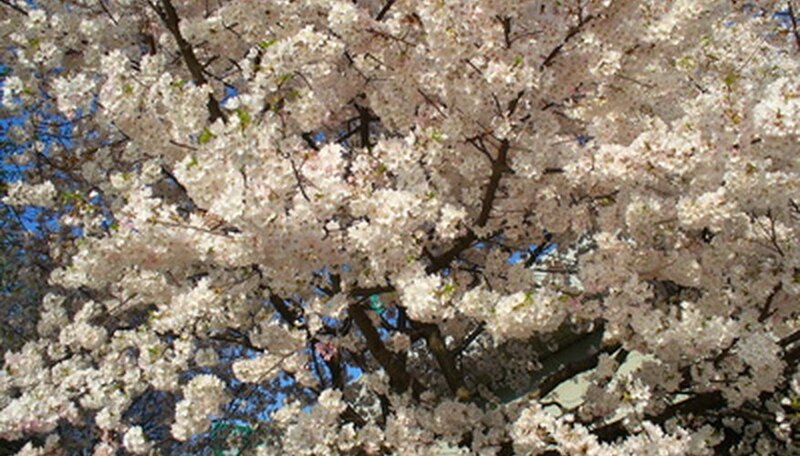 To prevent infection, keep your flowering crab tree vigorous through proper maintenance. Fire blight is a bacterial infection that destroys apples and causes leaves to look as though they have been scorched by fire. Flowering crabs are most susceptible to fire blight when temperatures are warmer than usual before bloom and in plants with wounds through which bacteria can easily enter. Caused by the bacterium Erwinia amylovora, fire blight infects flowering crabs by forming a sweet ooze on the bark's surface. Insects transport the bacteria to flowers and infection occurs. Symptoms are wilting blossoms that seem to be saturated in water, darkened twigs and dried fruit that remain on the branch. Although there is no cure for fire blight of flowering crabs, control includes using resistant varieties, maintaining healthy consistent growth, annual pruning and using a chemical spray before bloom. Sprays include aluminum tris, copper sprays and prohexadione-calcium, according to the Colorado State University Extension. Contact your local extension agent to determine the proper treatment. Rust, also known as cedar-apple rust, is a disease affecting flowering crab trees, according to the Colorado State University Extension. Rust is a disease caused by the fungus Gymnosporangium juniperi-virginianae. On flowering crab trees, rust causes the growth of wood-like galls on branches that turn orange and gelatinous. Once mature, the galls release spores. Symptoms may also include yellow-to-orange spots on leaves, the appearance of powder-like spores, fruit infection and leaf drop. Infection spreads during dry spells late in the summer. To control rust, choose resistant varieties, remove galls to prevent spreading of disease and consider use of chemical control if rust is severe. For chemical control, use a fungicide containing one of the following as an active ingredient: sulfur, copper soap, myclobutanil or chrlorothalonil, according to the Plant Disease Diagnostic Clinic at Cornell University. Contact your local extension agent for a treatment plan appropriate to your state. Infection of powdery mildew is a widespread problem of crabs as well as other plants. Caused by a variety of different fungi, powdery mildew is most prevalent in warm climates and dark, humid, densely planted areas with poor air circulation. Younger plants are more susceptible to powdery mildew than more established plants. The fungus creates "threads" that grow and feed on the surface of plant cells, injecting root structures into the plant's surface. Symptoms include a white-gray growth that resembles powder on leaf surfaces, flowers and fruit as well as early leaf drop and bloom failure, according to the Colorado State University Extension. To control powdery mildew, choose resistant plant varieties, do not apply nitrogen fertilizers late in the summer season, destroy infected parts of the plant, prune overcrowded plants or consider chemical options. For chemical control, apply sulfur, neem oil, triforine or potassium bicarbonate every seven to 14 days while the flowering crab grows, explains the Colorado State University Extension.